General George Hammond is acting a little strange as SG-1 prepares to disembark on a standard mission to P2X-555. He hands Captain Carter a note, telling her not to read it until she’s on the other side of the gate. Sam agrees, and the Stargate is dialed. Carter had to make additional calculations in the computer system — the wormhole traveling between Earth and their destination will come unusually close to the sun this time of year. With the extra gravity accounted for in the computer’s planetary drift calculations, SG-1 disembarks on their next mission. After stepping through the gate, though, the team finds themselves immediately back in the gate room on Earth. A few seconds later, reality begins to warp. The gate and the S.G.C. disappear, and SG-1 finds themselves in a missile silo standing where the gate room use to be. A rocket is about to be test fired right over their heads, until Teal’c disables it with his zat gun. SG-1 is immediately taken into custody by base personnel. Carter concludes that the gravitational pull of the sun caused the team to slingshot back in time — decades, so it appears, to a time when the lower levels of Cheyenne Mountain were used for missile testing. Carter demands that they do nothing to change the past or tell anyone who they really are, since it might change the timeline in ways they can’t begin to understand. Their goal is to get free and live out the rest of their lives in obscurity. O’Neill is interrogated, and gives up nothing to the base commander. The team — believed to be Russian spies — is put on a truck and sent from Colorado to New Mexico for further examination. Meanwhile, a young lieutenant has discovered the note placed in Sam’s vest pocket. It reads, “George — Help them,” and includes two dates and times. The soldier arranges for a flat tire during the team’s trip to New Mexico. He approaches them in the back while the driver changes the tire. Carter notices the name tag on the officer’s uniform: it is George Hammond, their commanding officer at the S.G.C. in 1999. The team convinces Hammond to listen to his future self and help them. They overpower the guards and escape, after destroying all of their technology. Jack is not content to give up on getting home; the mission is now to locate the Stargate and find a way home. In fact, years ago Carter was prompted by Hammond to research alternative uses for the Stargate — including time travel. She theorizes that establishing another wormhole to P2X-555 can send them back, so long as they time their trip at the exact moment of a solar flare. This seems impossible, since solar flares cannot be predicted. By the time a flare can be confirmed on Earth, it’s already too late. But Hammond, having met them in 1969 and knowing they would be lost in the past, has given them the information they need: the two dates and times written on the paper pinpoint the minute of solar flares. The General must have used Sam’s own research to find a way for them to get back; then he looked up the dates and times of two solar flares in 1969 and wrote them down. All will be for naught if SG-1 cannot find the Stargate. In 1969, it is sealed up in a government warehouse somewhere. Catherine Langford’s father is dead, and she has not yet assumed a position as head of Stargate research. But Daniel knows that she is living in New York. The team hooks up with a couple of traveling hippies. The two, Michael and Jenny, are driving their bus to a concert in New York before Michael has to join the military and be shipped to Vietnam. O’Neill, Carter, Jackson, and Teal’c join them in their cross-country trip and convince them to help. The team has about one week to find the Stargate. Once in New York, O’Neill and Teal’c are dropped off at an observatory to confirm that the first time and date do in fact pinpoint a solar flare. Meanwhile, Jackson and Carter locate Catherine — who’s father discovered the Stargate in Giza in 1928. Posing as the son of a German archaeologist with whom Dr. Langford was once associated, Daniel proves his knowledge of the top-secret “Doorway to Heaven” to Catherine. He convinces her to tell him where the Stargate is now — a military armory in Washington, D.C.
With the solar flare confirmed and the Stargate located, SG-1 makes the trip to Washington. They say their goodbyes to Michael and Jenny, with whom they have grown close. The team zats the small number of guards, and powers up the Stargate by connecting it to a car battery. Teal’c dials the Stargate and establishes a wormhole, but SG-1 is discovered and comes under fire from the guards who have stumbled upon them. O’Neill is forced to order the team through the Stargate a few seconds too soon. They do find themselves on Earth again — in the Cheyenne Mountain gate room. But now, they are far into the future. The place appears deserted, and large cloths cover objects in the room. An older woman enters the room, and knows them all by name. Happy to see them again (and to see them looking so young), it is Cassandra, the young girl that the team rescued from a world invaded by the Goa’uld (“Singularity”). She hugs Captain Carter, but must rush them all back through the Stargate. Finally, SG-1 emerges in the gate room back in 1999. General Hammond welcomes them home, and tells them that he’s been waiting for this to happen since he met them. When he saw a large cut on Sam’s hand, he knew the time had come; it was the same cut he had seen on her hand when he took off her handcuffs in 1969. Carter states that the wormhole will take them close to the sun at this time of year — within 70,000 miles. The computer’s drift calculations had to be updated to take into account gravitational space-time warping. What does this mean? The S.G.C.’s list of Stargate addresses was taken from the Goa’uld’s ancient map left in a cave on Abydos (“Children of the Gods”). Planetary drift (under the expanding universe model) would, after many thousands of years, render some addresses invalid. The computer recalculates these addresses based on a fixed planetary drift model and, in some cases, changes a symbol or two to “update” the address to a given planet. At this particular time of year, according to Carter, the direct line between the Earth and the team’s destination takes them close to the sun — and the added gravity could throw the wormhole off track. When recalculating the address based on planetary drift, this extra gravity would have to be taken into account — though the final Stargate address dialed might not be any different because of it. An alternate explanation is the timing factor, which Daniel mentioned. While the increased gravity from the sun might not change the seven-symbol Stargate address, it would require that the team wait until they were in correct alignment with the sun before gating — to avoid complications like time travel. The extra time that they waited would have been countered by the solar flare, which could not have been predicted. SG-1 was thrown back in time not because the computer failed in its gravitational calculations, but because a solar flare erupted on the sun the moment that the team passed by it while traveling through the wormhole. This caused the wormhole to “slingshot” around the sun — a theoretical means of time travel (and, incidentally, the same means used by the crew of the Enterprise in Star Trek IV: The Voyage Home). For a few seconds, the team appeared to occupy both time periods simultaneously. The time dilation affect of the slingshot around the sun did not take affect until after the wormhole had reconnected to Earth’s Stargate. Otherwise, the wormhole would have connected to the boxed-up gate at the military armory in 1969. After SG-1 completed the slingshot, the time dilation took affect. Captain Carter warned the team against changing anything in Earth history because of the Grandfather Paradox. This principle states that if you go back in time and kill your own grandfather, you would never be born — and therefore unable to go back in time to kill your grandfather, in which case you would be born. The time travel theory that is implied here (and in many science fiction shows) is that alternate universes exist for every moment of time. SG-1 could travel into its own future because somewhere, in some dimension, all the intervening moments had occurred. On some “version” of Earth it was decades past 1999. You would not “blink” out of existence if you went back in time and killed your grandfather, because you would be traveling to a different version of reality. The reality from which you come would remain the same (though getting back to it after altering the past would be a problem). The paradox aside, it should suffice to say that altering the past can have tremendous ramifications on the future. O’Neill gave two false names during his interrogation: James T. Kirk and Luke Skywalker. The major who was questioning him was not familiar with Star Trek, which aired from 1966 to 1969 but did not gain widespread popularity until the 1970s. As for Star Wars, it would not hit theaters for another 8 years. O’Neill destroyed the team’s advanced equipment with a zat gun, after pulling out a G.D.O. (to signal the S.G.C. upon returning) and a small black bag. The contents of the bag, if significant, are never shown. Michael and Jenny were traveling to “a concert in upstate New York” — Woodstock, no doubt. During their drive across the United States, SG-1 passes through Chicago, and the Sears Tower is shown briefly. This is an anachronism — construction on the tower did not begin until 1970. It opened its doors in 1973. After the first Abydos mission (“Stargate” the Movie), General Hammond asked Carter to explore alternate applications for the Stargate — including time travel. She determined that if a wormhole came close enough to the sun at the exact moment of a solar flare, the magnetic field of the flare could redirect the wormhole closer to the sun. The increased gravity could slingshot the travelers around the sun and back to Earth. General Hammond likely asked Carter to research the potential of using the gate for time travel because he knew that the yet unformed SG-1 would be trapped in 1969, and would need a way home. Heinrich Grüper (whose son Daniel impersonated) worked with Dr. Langford (Catherine’s father, whose expedition uncovered the Stargate in Giza, Egypt in 1928). Catherine told Daniel and Sam that they had always known their had to be a second device with which to control the ring — the D.H.D. (dial-home device). It seems awkward that the U.S. military would store the Stargate upright in 1969, as SG-1 discovered it. In order to go forward in time instead of backward, Hammond had to locate flares on the opposite side of the sun. This alone does not seem to fit the above time travel theory very well. Not only would the direct line between Earth and P2X-555 have to take the wormhole close to the sun again in 1969, but it would have to do so on the opposite side of the sun in order for the 1969 solar flares to affect the wormhole. When Cassandra opened the future Stargate to send SG-1 to 1999, she used a hand device to automatically establish a wormhole without dialing the gate. This technology has been used in the past by Apophis (“Children of the Gods”) and by the Nox woman Lya (“Enigma”). Future Cassie appears to be in her 60s or 70s. She is 12 in 1998, so SG-1 was thrown forward to around the year 2050 to 2060. Cassandra told SG-1 that “the timing must be precise” in sending them back in time. Why? It is conceivable that by the middle of the twenty-first century, Earth is able to predict solar flares. Or, she may have been using it as an excuse to hurry them away, in spite of the fact that time travel has become a fairly simple thing. One plausible explanation for the latter may be this: the Stargate would not be abandoned by Earth in just 50 or so years. It is logical that the future S.G.C. would have determined a day and time to expect SG-1, and evacuated the gate room, covered up new technologies and made the base appear deserted in order to protect SG-1 from learning too much about the future. It is also noteworthy that the gate itself is not located in another facility so many decades later. If a Goa’uld larva matures within a Jaffa’s pouch and is not implanted within a host, it will take over the Jaffa as its host. Zat’ni’katel guns are capable of disintegrating inanimate objects (with three blasts, the same as with living matter). George Hammond – George Hammond was a lieutenant in 1969, assigned to the lower level missile testing facility at the Cheyenne Mountain Complex. He encountered SG-1, thrown back 30 years into the past, and helped them to escape from military custody. He has been waiting for the event to occur since he met Carter, O’Neill and Jackson and SG-1 was formed. Using Carter’s research, General Hammond also devised a way for them to travel forward in time, from 1969 to 1999. George Hammond watched the moon landing from his father’s hospital bedside two days after his father’s first heart attack. Daniel Jackson – Daniel was probably born in 1965, since he told his teammates that he was about 4 and a half years old in 1969. He speaks 24 different languages, including Russian and German. And if Cassandra is to be believed, Daniel will go bald in his old age. Samantha Carter – After the original Abydos mission, General Hammond assigned Carter to research alternate applications for the Stargate — including time travel. Teal’c – Teal’c revealed to his teammates that if his Goa’uld symbiote matures and does not find a ready host, it will take him over as its new host. Catherine Langford – Catherine lived in New York in 1969. The Stargate program had not yet been reestablished, but Catherine was well educated on the Stargate and her father’s work. Is it possible to use solar flare predictions to deliberately travel in time, and even to target an approximate time period? Do wormholes that are affected by solar flares always bend back to the initiating Stargate, or is it possible to arrive on another world in a different time period … and perhaps not know it? Did Michael go to Vietnam, or dodge the draft? How far into the future did SG-1 travel? What is the state of the S.G.C. (and Earth) in that time period? How did Cassie know exactly when SG-1 would arrive in the future? How did Cassandra send the team back in time? VOTE! 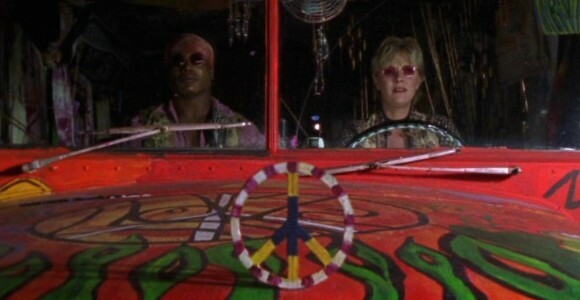 How would you rate SG-1's "1969?"